SEATTLE - Vancouver Whitecaps FC returned to CenturyLink Field to take on a Seattle side that ousted Vancouver in the 2018 MLS playoff quarterfinal round. Whitecaps FC were looking to get some revenge, but Sounders FC had other ideas. Seattle prevailed with a convincing 2-0 victory over their Cascadian rivals in front of 41,849 spectators. It was the Nicolas Lodiero show as the Seattle designated player scored a first half brace. Stefan Frei was not tested enough as he made two saves to earn his third clean sheet of the season. "We've had an open chat in the locker room." Whitecaps FC Coach Carl Robinson said post-match. "The brutal assessment is, we're too soft, we give away too many goals, soft goals. Two mistakes today in the first 30 minutes against a good team, and you're not going to win games of football like that. It's disappointing, my blood is boiling at the moment. We're not good enough to just turn it on and off when we want, and you've seen that this week, by the goals we've conceded at the top of the box." Coach Brian Schmetzer's Sounders FC slowly climb closer to a possible playoff spot with a 5-9-5 record. Whitecaps FC fall further down the table with a 7-9-5 record. It was a tall order for Robinson's Whitecaps as they were without their 17 year-old phenom, Alphonso Davies. Reports linking him to Bayern Munich have not been confirmed. Robinson was tight-lipped when asked about Davies team status. "Alphonso's got permission from the football club to take the weekend off." Robinson explained. "It was the same process on Wednesday night. Although people didn't know that and made assumptions that he was unable to play, and he wasn't, due to what's going on at the moment. I think you'll read a little bit more news in the coming day or two. Obviously its positive for him and us." "We know it's not good enough." Felipe told reporters. "We as the leaders of the team, we need to do better. I always look in the mirror and see first myself and then for the others. I know I can do more for this team, I need to do more. It just hurts. It's easy to come here and talk about a reset, and all those things, if you don't win a game, then it doesn't matter anything." "We have 13 league games, we have 3 games in the cup. It's important tonight that we all go home to our families, but we look in the mirror. The problem is not formation, it's not coaches, the problem is us. We step on the field, we go, it's our faces. It's our job to put the energy level at the highest we can. It's our job to help each other, to make a difference on the field. It's not about pointing fingers, it's about us." Stefan Marinovic made his MLS return following a two-month absence as he recovered from a sprained knee, and concussion sustained in May. It wasn't an easy start for the Kiwi shot-stopper. Whitecaps FC were quickly under the cosh. Referee Chris Penso awarded Sounders FC a penalty in the 5th minute after a ball into the Vancouver box hit Doneil Henry's raised arm. Lodeiro calmly stepped up and sent Marinovic the wrong way to make it 1-0 Seattle. It was a first half to forget for Marinovic as his blunder helped Seattle jump out to a 2-0 advantage. Captain Lodeiro sent a rocket from 35 yards out that took a slight deflection before hitting the Caps keeper. Marinovic got a hand to the ball as it dipped past him, but it was not enough to keep it out in the 31'. Whitecaps FC looked like they may have caught a break just before the interval, but VAR wasn't in a giving mood. A ball to the shoulder and not the arm of Chad Marshall resulted in a penalty decision being over turned. Vancouver went into the break trailing 2-0. Seattle was in compete cruise control and had no incentive to pile up the goals. The absence of Alphonso Davies loomed large as Vancouver struggled to maintain possession and push forward to generate offence. 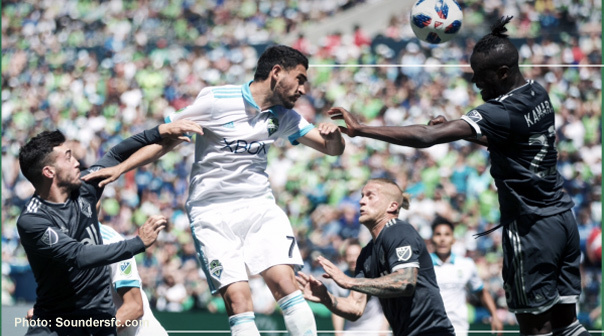 Sounders FC were content to keep Vancouver from advancing as they controlled the midfield battle as well as the score-board. As we've seen with Vancouver on multiple times this season, emotions can get the better of Whitecaps FC players. Effy Juarez was ejected from the match in the 77' minute after earning a yellow card, and a straight red in rapid succession. The first for a rash challenge on Lodeiro. While protesting his innocence, Juarez bumped referee Chris Penso. "I'm sick of it, I told them I'm sick of it." Robinson said, of his teams issues with discipline. "They're letting themselves down, they're letting me down, they're letting the club down. I don't condone it. I'll try to protect them as much as I can." Whitecaps FC played the final 13 minutes of the match down to ten players. It just wasn't a glorious day of football for Vancouver Whitecaps FC. The Sounders soundly prevailed. You need marquee players to step up in the crunch and what an occasion to do so in a Cascadia darby match. Nicolas Lodeiro doubled his goal-scoring with a first half brace. Seattle was never in danger with Loderio on the pitch. The Uruguayan feasted on Whitecaps FC and helped Seattle take all three points.